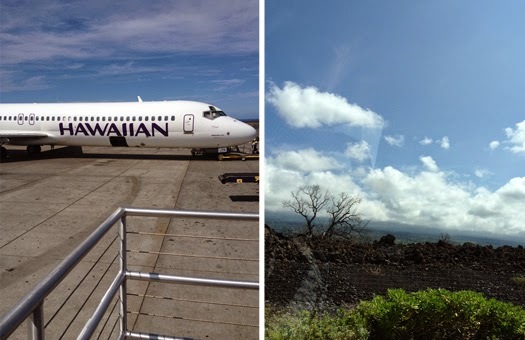 yesterday i went to Kona for work. 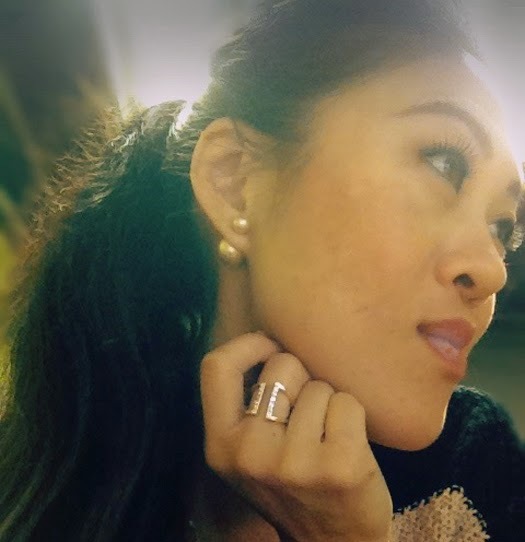 i was wearing my new favorite earrings - the pearl 360 studs from BaubleBar. 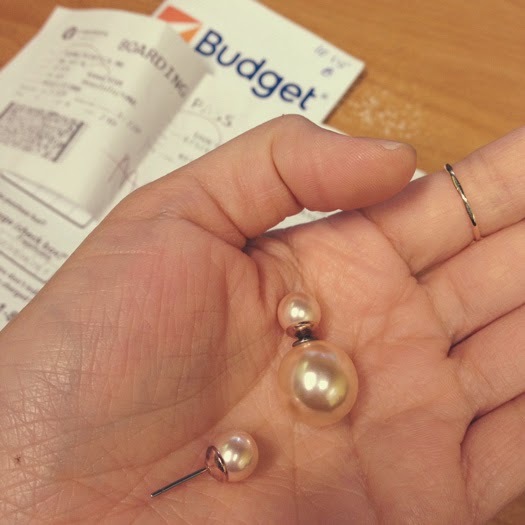 after i got off the plane, i went to the bathroom, and as i was walking out, a guy grabbed me and said, "miss, are you wearing pearl earrings?" i wasn't sure where he was going with this question, whether he was inquiring about them or what, but i instinctively reached up to feel my earrings and said, "yes, i am." he went on to explain that he had found an earring on the plane ramp and left it with the agent at the gate. i realized that my left earring was indeed missing, so i thanked him and headed back to the gate. when i got to the gate, they presented me with the (smaller pearl) earring only, and i thought (but actually said out loud), "awww, only one?" i tried to explain to the guy that the backing (the bigger pearl) was missing and asked if he could take a look around since i couldn't go back on the tarmac. mind you, there were tons of onlookers waiting for the next flight, and i had two agents looking for my earring! but it wasn't just any backing; it was the big pearl! i could hear the two agents saying how it could have fallen off anywhere, that they'd never find it. so i thanked them and left, pouting inside...bummed about my short-lived earrings. 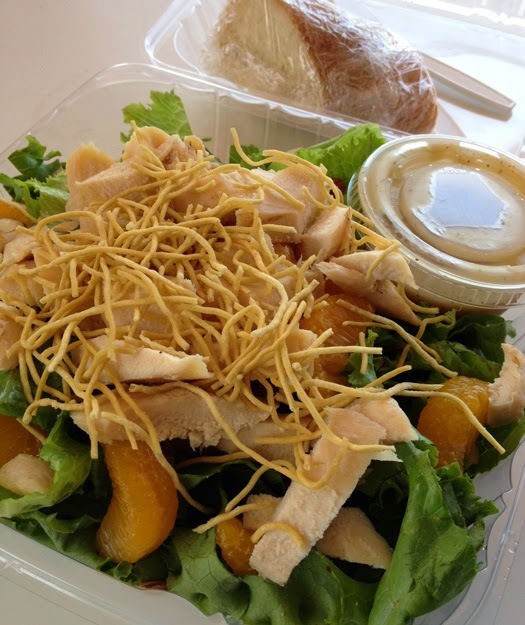 yummy oriental chicken salad from Buns in the Sun. ...went to the bathroom to wash up before heading back to the airport. i noticed in the mirror that my shirt button came undone. i looked down to button it, and what did i see nestled in my cleavage??? the big pearl backing! they were never going to find that backing! missing something? check the cleavage. Lol. That is a funny story. Glad you found the big pearl. Really?! Wow. What a funny story. Hahah, the story is funny indeed! Good for you that you finally found the bigger pearl! The earrings are gorgeous! Hahaha, that's priceless. Thank goodness for cleavage to catch things! Happy you got your backing back, there's nothing more tragic than losing an earring. Such a funny story! Glad you found it! hahahaha I love it! So glad you found your other part of your earring. They are so cute! what a story! so glad they had one part of it and one falling in your cleavage (that has happened to me) LOL. glad you have all the pieces becks. too funny! can't believe it survived the wash, lol!